Hi, I am interested in your 2019 Keystone Bullet (stock #32569) listed on Autotrader for $24,995. I'd like to get more information about this vehicle and confirm its availability. 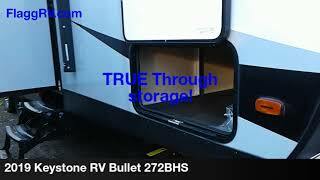 Your familywill enjoy any camping trip you take when you travel with this Bullet travel trailer. This is the ideal trailer for a large family because it contains all of the accommodations you need to sleep nine people each night. Thesingle slidemaximizes the living space and gives this trailer room for a set of double bunk beds which will have the kids jumping with excitement whenever you tell them its bed time. Because this unit has a dual entry, you have direct access into the rear bathroom which eliminates mud being tracked all over the clean floors as you make your way to the shower. Whether youre spending your time soaking up the sun at the edge of the lake or trekking into the forest on a hunt for fresh berries, the Keystone Bullet travel trailer will not only get you to your destination, but it will also keep you happy while youre there. With themostluxury featuresof any other ultra lite trailer, like the exterior speakers,laundry chute, andLED lighting, the Bullet continues to provide thenumber oneultra lite travel trailer in America. Because of the contoured shape of theradius front profileon the Bullet, it offers less wind resistance as you tow it along the highway, and when you combine that with the extremely lightweight floor plan design, you get one unit that will help you cut costs when spending money on fuel.